The Bionic has LTE 4G support, a dual-core 1GHz processor, a massive 4.3-inch qHD display, 512MB of RAM, an 8MP standard camera and a front-side VGA camera for video conferencing. Furthermore, the device has HDMI-out and 'Mirror Mode' for simultaneous video streaming. All content from the HDMI-out can be played back in 1080p Full HD. The device also comes with remote wipe, data security and encryption capabilities, making it a strong choice for corporations, adds Motorola. 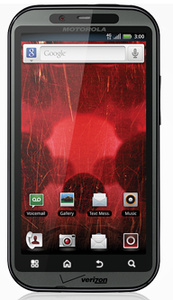 DROID BIONIC brings to life the speed and power of Verizon's 4G LTE network, giving consumers an unrivaled mobile experience. Whether downloading movies in minutes, connecting with friends or co-workers through video conferencing, or blazing through the Internet, Motorola's DROID BIONIC is what the 4G LTE experience is all about. DROID BIONIC is the epitome of speed, providing consumers with instantaneous access to their personal and work content, anytime and anyplace. By combining such a powerful mobile device with the performance and capabilities of Verizon's 4G LTE network, we're empowering consumers to define how they want to live their mobile lifestyles. Get the Moto Atrix instead. It only has a 5MP Camera, but it has 1GB RAM, and it looks thinner too. It's about 1mm thinner than the HTC Desire, a few mm shorter, but a few wider. or for Looks: Sony Xperia Arc vs LG Optimus Black. But I'm probably going to go with the Atrix. Samsung and HTC dissapointed with their phones at CES. Micorosft WP7 keynote was a joke. I know they're waiting for MWC but I've waited long enough to replace my dying 4 year old phone. In the past few years, LG's TV's and Phones have absolutely sucked, but man have they ever upped the anti. I'm hoping the Optimus Black has nothing less than a 1Ghz CPU. That thing looks awesome.